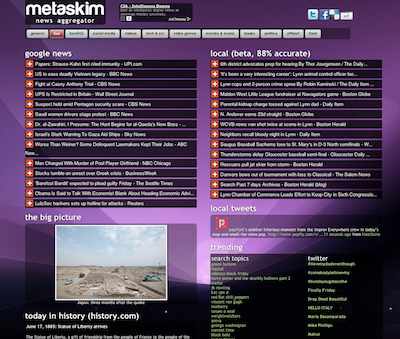 metaskim is a news aggregator that keeps you updated on local and world news along with the popular links, videos, tv shows, movies, books and food. Unlike other news aggregators, metaskim comes equipped with a slick content viewing system that doesn’t require you to open dozens of tabs. In addition, metaskim also has better content and localization. Next post: FiversWorld.com – What would you do for $5? Previous post: 8minutes – How Many Comments Can You Get in 8 Minutes?